"A remarkable whodunit that's as sharp as it is concise. Brar enhances her taut murder mystery with an engaging setting that effectively incorporates the local culture. The smart, believable denouement will have readers looking forward to Brar's next endeavor." "A literary mystery saga that includes far more depth and psychological and cultural insights than your typical murder mystery's scenario." Set in the Himalayan foothills, this murder mystery is the quint essential sleuth detective story with a beautiful backdrop. As the novel starts out on the balcony of the Bhardwaj’s couple on a gorgeous morning, it develops into a story with detailed background of the family affairs and upbringing of these characters that led their marriage to that day. Not only has their long marriage been rocky, but the drama of inheritance and bitter grief has set a shaky foundation for the “success” they have built. So intertwined and complicated are the relationships to the rest of the family that one could say, hatred that created lies has short legs, because it will always come to light and get you back. Sharma, the superintendent of the Police and his co-inspector Rawat are investigating the murder of Devika Singh. Employed by Dr. Bhardwaj at the hospital, she turns out dead, which some say might be the final pay-back for her nasty ways to others. Devika had a reputation for being knifing and rude to others most of her life. A connection that goes back to the Bhardwaj’s family seems at first look to stem from an affair she’s had, but ultimately a twist in the plot changes the entire investigation, but not after another tragic death has occurred. Could this have been avoided? A case of family drama, animosities and backstabbing awaits Sharma, but his experience will crack the case old-school. My reading experience of this book was that of a long one. Many witness accounts and interviews made it a slow moving process to read through. However, the writing was well done and the curve balls well played. Each chapter began with a famous quote. Each of them rather good. A lot of highlighting in my kindle happened there. I thought they were cleverly placed allowing wordplay to elude to the content of the next chapter. This book is promising. The setting is fantastic. I haven’t read a sleuth story in a while. 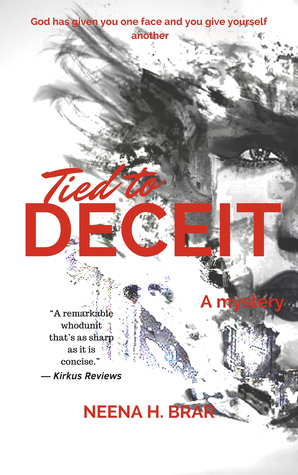 So, if you enjoy them too, I recommend TIED TO DECEIT. I received a copy of this novel from Netgalley in exchange of an honest review. All opinions are my own. Thank you kindly.